Formerly homeless residents at two Los Angeles supportive housing projects will soon have wheels to get to jobs and job training, school, interviews, medical appointments, sober meetings, and gatherings with loved ones – courtesy of a teenage Eagle Scout candidate and competitive bicyclist. 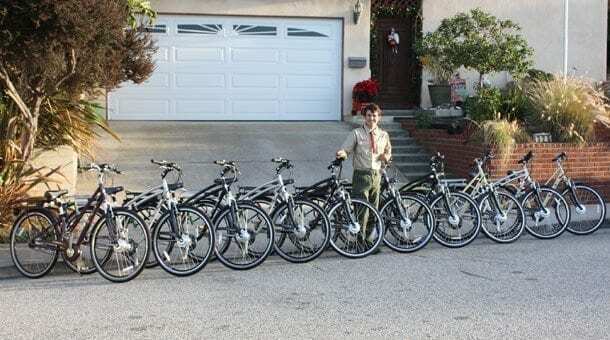 Diego Binatena of Boy Scout Troop 927 in Westchester learned that the Los Angeles County Bicycle Coalition (LACBC), a bicycle advocacy group, was looking for a good home for 20 electric pedal-assist bicycles that were sitting unassembled in a warehouse due to the closure of a bicycle company. 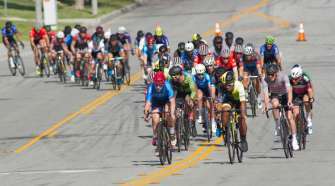 “A bicycle is a terrible thing to waste,” joked Binatena, a Scout since first grade, a bicycle commuter and national-level competitive racing cyclist. More seriously, said the Playa del Rey teenager, he created “Cycle Forward BIKESHARE” as his Eagle Scout Service Project to put the LACBC bicycles to use as transportation for formerly homeless youth and men trying to improve their lives. Binatena is aware of the effects of poverty and homelessness. His mother, Julie Lansing, is the administrator of a rent-subsidy housing program for low-income families and chronically homeless adults. Binatena found his partners and beneficiaries for BIKESHARE at two Los Angeles transitional housing agencies: Jovenes, Inc, in Boyle Heights and PATH La Kretz Villas in East Hollywood. Jovenes focuses on helping at-risk men ages 18-25 years and PATH provides intensive supporting housing for 48 residents. “Moving around the city is a tremendous challenge for our residents, and this bike sharing program will make a real difference,” said Eric Hubbard, Development Director for Jovenes, Inc.
Binatena launched his project in September and quickly learned that for his project, the Boy Scout motto “Be Prepared” required hard work, money and friends. After consulting with bicycle advocates, he set a $25,000 budget for the project. Beyond the bikes donated by the LACBC, valued at $1,000 each, he needed bike racks, safety equipment, locks, commuter bags, and safe-cycling program materials. With a polished Power Point presentation in hand, Binatena got agenda time at the Westchester/Playa and East Hollywood Neighborhood Councils and the Westchester Rotary Club. He left all three meetings with checks in his pocket. He got donations from the South Bay and Los Angeles Wheelmen Bicycle Clubs and the Southern California Gas Co. He successfully solicited bicycle accessories, and safety equipment from KHS Bicycles, Collision & Injury Dynamics, and Planet Bike. He recruited fellow Scouts and friends to assemble the bicycles and racks. Three months after project launch, Binatena exceeded his goal: He collected $2,700 in donations and $2,300 worth of bicycle equipment. “I was not prepared for such a positive reaction from everyone,” he said. Hard work and persistence are not new to Binatena. 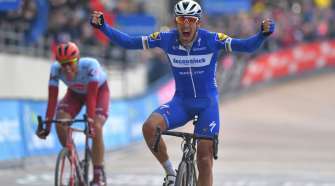 Bicycle racing requires planning, preparation and focus – plus countless hours on the bike in training to compete at a high level, he said. 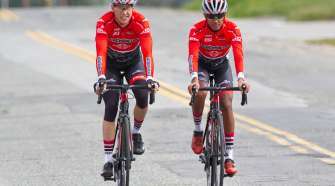 After winning the 2013 California Junior State Road Championships and other elite races, he was recruited by the USA Cycling National Team to race in Europe against the best in the world. When Cycle Forward “BIKESHARE” is rolling at PATH and Jovenes, Binatena will present his service project to the Eagle Board of Review to become an Eagle Scout, the highest rank a Boy Scout can achieve.